When I first started cooking sous-vide, the holy grail was temperature accuracy and stability. I think this is very important for certain applications such as eggs, and for professionals and sous vide geeks. However, if you are a general home user, I don't think accuracy and stability to within 1º is of the utmost importance. That being said, I know this is important for most of the regular readers of this blog. Unfortunately, I have a job and I don't own a high quality data logger (*), so I am not able to give you a super accurate reading on the temperature of the water bath. 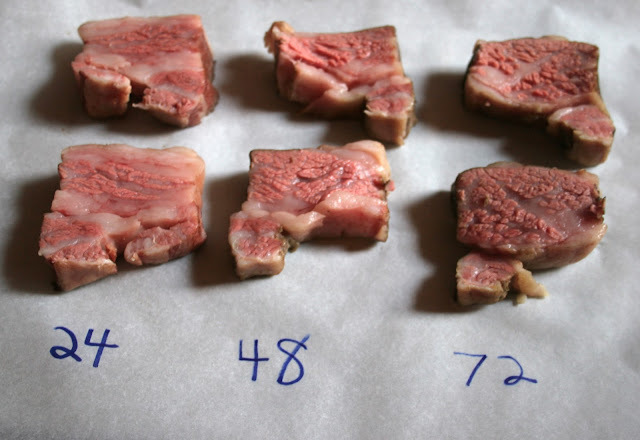 I will tell you that I recently ran a 136ºF short rib from one to three days inside of the SousVide Supreme Demi. I checked in to see what the readings of the SVS Demi's PID controller, and would see it vary from 135F - 137F. I confirmed some of these readings with digital thermometer that was rated with +/- 1ºF accuracy. That being said, I want to rerun some tests to see if I can get different results. For example, I ran the device with the water being filled up to the fill line and not to the max line. With more water in the device, I might have seen more stability. 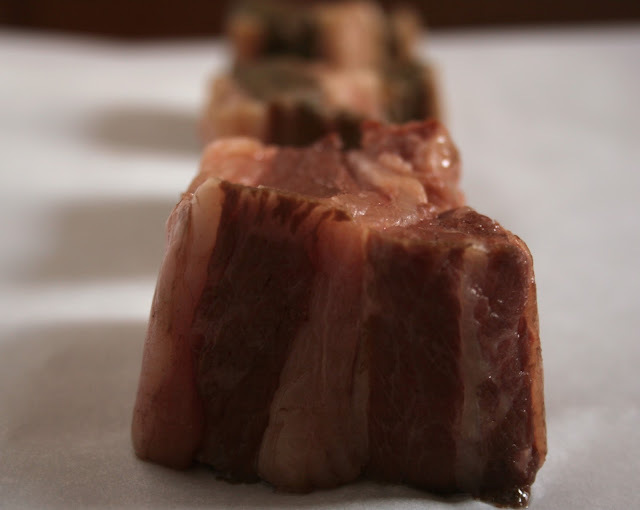 Now, let's talk about my favorite cut of beef to prepare sous vide: the short rib. The reason this is my favorite is that you can prepare a short rib medium rare, and have it be the most unctuous and tender short rib you have ever eaten. This is because you can break down collagen at 136ºF and not over cook the meat, and while fats break down, they don't render out. Set SousVide Supreme Demi's temperature to 136F. Will convert collagen to gelatin slowly, keeping meat medium rare. 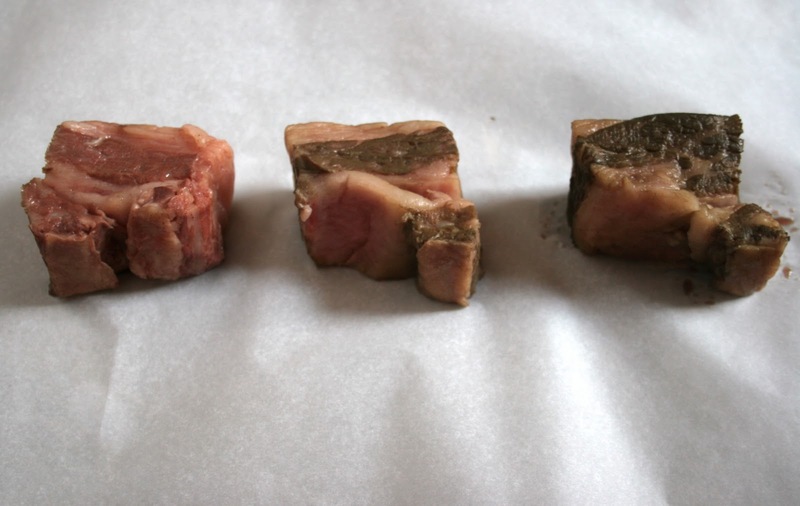 Drop three slices of the same short rib at 24 hour time intervals. Each short rib had zero additions (no fat, no salt). Remove bags at same time. Now I have 24 hour, 48 hour and 72 hour samples. The exteriors of all three pieces are vastly different in color. This doesn't typically matter much, as you will usually post cook sear the meat anyways. I was a little surprised by the fact that the 48 and 72 had such a different color. The 24 remained basically pink while the 72 is almost lacquered. The interiors looked a lot more similar. The 72H looks a little darker because of inadequate lighting. I was secretly hoping that I would see more detail in the differences between the 48 and the 72. There is such a difference between them when you eat them that it is a little disappointing to see that there is no visible magic. It's like cutting up the goose that laid the golden egg and instead of finding golden eggs just seeing guts. (*) Does anyone have any recommendations on a good temperature data logger? Ideally, I would like something like the Voltcraft K202, but it isn't available here in the US. I use this combo in my wine cellar (I have a different logger with relative humidity). It is very straightforward. S o o o o o o where are your F's? I use the Voltcraft K202 and am happy with it. I know Douglas Baldwin uses the Extech REA 15 [http://www.extech.com/instruments/product.asp?catid=64&prodid=408]. It comes with RS232, but there are serial-to-USB cables. Thanks for the input. I actually looking for a Voltcraft distributor in the US and couldnt find one. I'll give the Extech a try (I'll also ask Douglas about it). I have the MyPcLab from Novus. Has worked fine for me (although the software often requires a couple of restarts). I also appreciate you mentioning the color of meat cooked sous vide. Some times this color can be really disagreable and a thorough browning is really required! But I would like to learn more about what causes the green-brownish color! ps: When is the next TGRWT happening? You say "There is such a difference between them when you eat them that it is a little disappointing to see that there is no visible magic."... So, what *is* the difference when you eat them? "There is such a difference between them when you eat them that it is a little disappointing to see that there is no visible magic." ... OK. What's the difference? Which one is preferred? The most notable difference between all of these is the amount of collagen denaturing that has occurred. The 72 hour has the most significant amount, leaving the short rib incredibly tender. I am sure other people have different preferences (and it also depends on the application), but for for general use, I'd take the 72 hour any day of the week. Thanks for the response. The 72 doesn't quite look appetizing in the pictures so I would not have guessed! I'm deciding between the Demi and the Supreme. I saw your post on the matter, but since there's not much of a price difference, I'm not sure what to do. Thanks! No problem. If price isn't a consideration then I think it literally comes down to size and how much space you have.